The Mt. 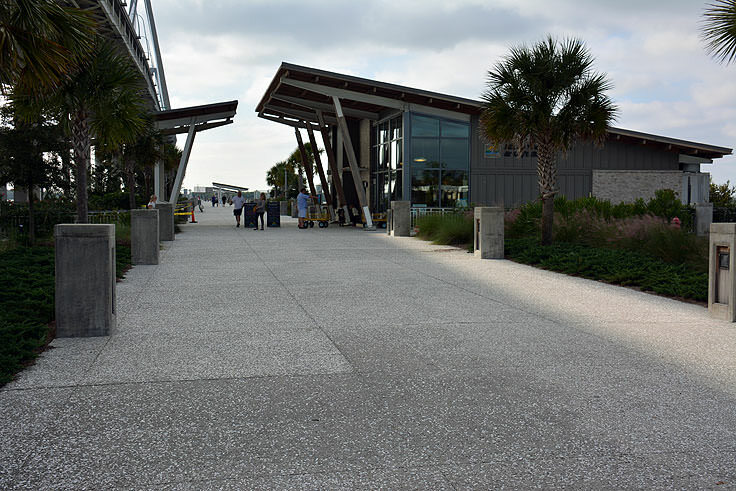 Pleasant Memorial Waterfront Park is so much more than just a pretty patch of grass to enjoy coastal South Carolina's waterfront views. 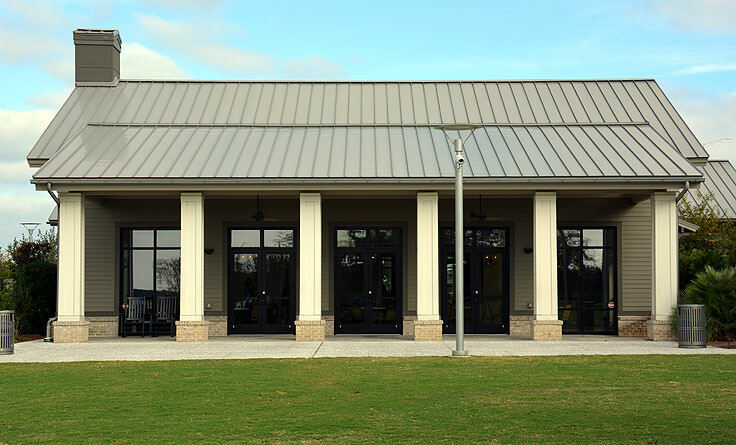 The expansive 14 acre site is home to countless amenities, including a stunning war memorial, a kids' playground, a cafe and gift shop, a bait and tackle store, a pavilion, and one of the longest fishing piers in the Charleston area. With all of these amenities and stunning views of the overhead Arthur Ravenel Bridge, it's no wonder that this already-legendary landmark ranks at the top of Mt. Pleasant's "Best Places to Visit." 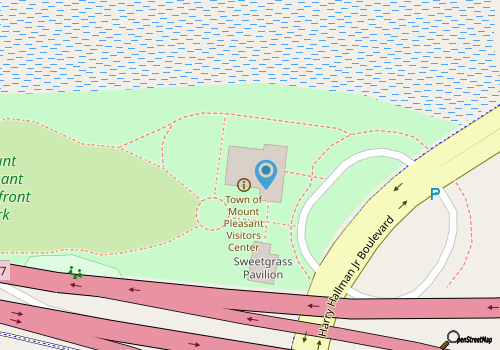 The 14 million dollar park is one of the newest additions to the Mt. Pleasant public parks scene, and is already receiving a welcoming and enthusiastic reception. Built almost directly under the long Arthur Ravenel Bridge, the long bridge over the Cooper River which connects Mt. Pleasant with its coastal neighbor, Charleston, this park makes great use of an otherwise limited 14 acre waterfront space. 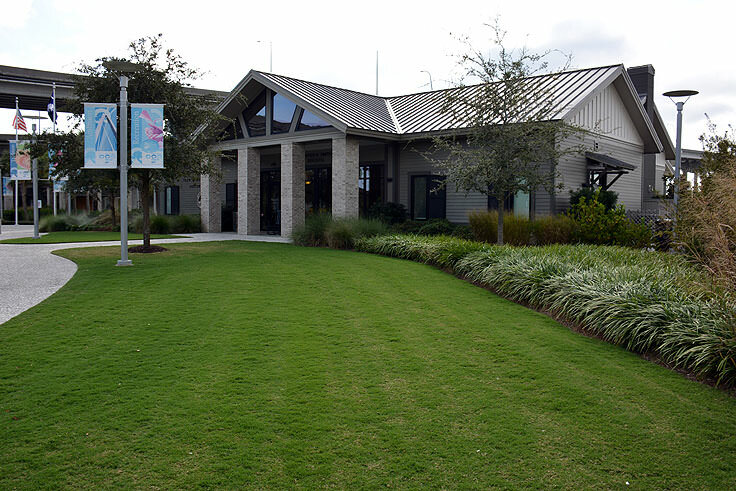 Free parking is available for up to 300 vehicles, and a "visitors' center" complex anchors the main entrance, complete with restrooms and the Sweetgrass Cultural Arts Pavilion, a unique gallery that showcases a range of permanent and travelling exhibits, including a surprisingly fascinating display on the history and art of the pavilion's namesake, sweetgrass baskets. This locally homegrown art form is dwindling, as native regional sweetgrass is disappearing, but exceptional examples of this craft at its finest can be viewed throughout the center. Hungry visitors can also stop by the River Watch Cafe and Gift Shop for made-to-order sandwiches, ice cream, and fresh baked pastries to enjoy along the extensive waterfront green spaces or public fishing pier. A local favorite is the wide variety of freshly grilled Paninis, especially "The Lowcountry Legend" - a tasty and satisfying combination of Pimento Cheese & Bacon. There's also a gift shop for apparel, postcards, books and trinkets of all genres to take back home as a well-loved souvenir. Both the gift shop and cafe have season hours that range from 8:00 a.m. through 5:00 p.m.in the winter months to 6:00 a.m. through 10:00 p.m. in the summer months, with slight variations in the seasons in between. For enjoying a hot meal or ice cold snack outdoors, patrons can head out to the covered patio adjacent to the cafe, or take a stroll and find a shaded table or sunny bench overlooking the water. 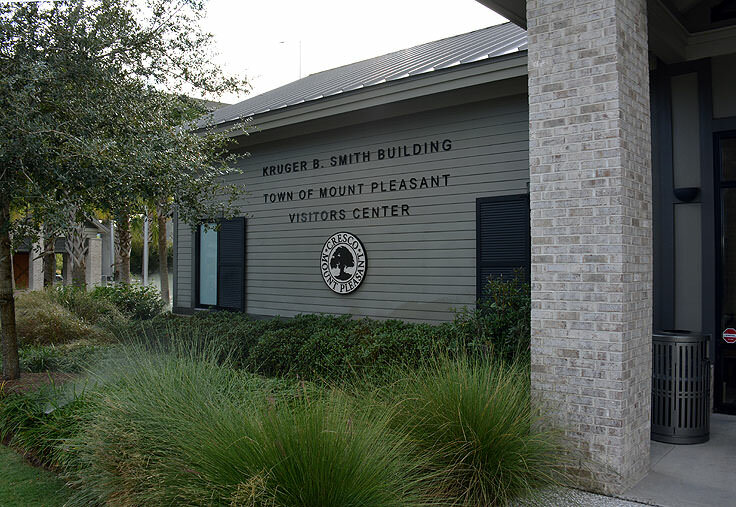 The park features a number of spots to take a load off and enjoy a great view overlooking the towering palmetto trees, well-manicured grassy areas, and waterfront borders of the Cooper River. The War Memorial is another stunning locale to enjoy a quiet stroll, as the stone circular area has tall Roman columns and inscriptions honoring the region's many local heroes. In-set stone borders allow visitors to rest and take in the scene in at their leisure, in the shade or in the sun. 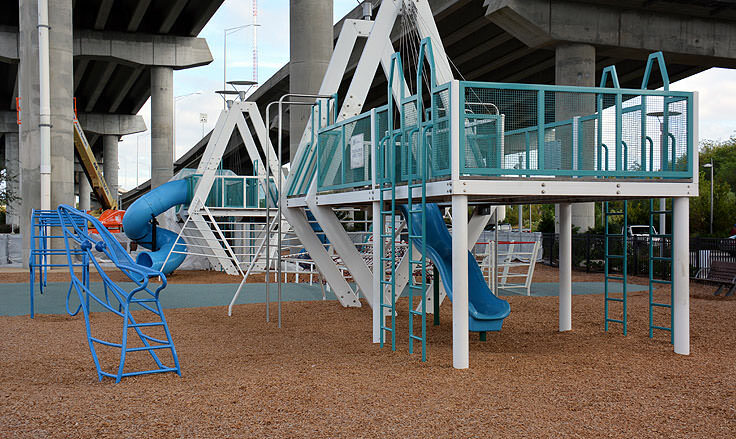 A playground is also located on site, complete with a unique themed "bridge play area," with equipment that replicates the Arthur Ravenel Bridge in miniature, and is ideal for climbing and exploring. There are also plenty of swing sets, large grassy fields for Frisbee or tag, and benches scattered throughout where parents can quietly monitor the action in comfort. The most popular and unique aspect of the park, especially for avid anglers, is easily the on-site fishing pier. The 1,250' foot long structure is one of the longest in Charleston County, and stretches out well over the Charleston Harbor, almost directly under the bridge. Bait, tackle and rod rentals are available at the tackle shop, and visitors can fish or handline crab to their heart's delight in the very fruitful waters below. With angling available on both sides of the pier, and inherent shady areas provided by the bridge overhead itself, the pier is easily one of the most unique fishing piers on the North or South Carolina coastline. Fishermen can enjoy the pier at their leisure for around $8 per day, or $5 for Charleston County residents, while everyone is invited to enjoy a stroll over the water and take full advantage of some of the coolest waterfront photo opts on the coast. Mt. Pleasant Memorial Waterfront really shines when it comes to special events, as despite its relatively new stature as a premier local park, it has nonetheless has become the venue of choice for a number of community-wide outings, both public and private. The 8,100' square foot covered pavilion is the launching point for a number of these events, which include summertime movies on the grand lawn, shaggin' contests and beach music concerts with local live bands, and other community fairs and festivals. All of these events are free to the public, and anglers will want to keep their eye out for the annual fishing tournaments that have taken root on the pier, particularly the Folly Beach Fishing Pier Tournaments, Mt. Pleasant Pier Fishing Tournaments, and the Charleston Trident Fishing Tournament. Portions of the park, including the covered pavilion, can even be rented out for small weddings or gala ceremonies, with incredible over-the-water Charleston and riverfront vistas that the wedding party and guests alike will never forget. The Mt. 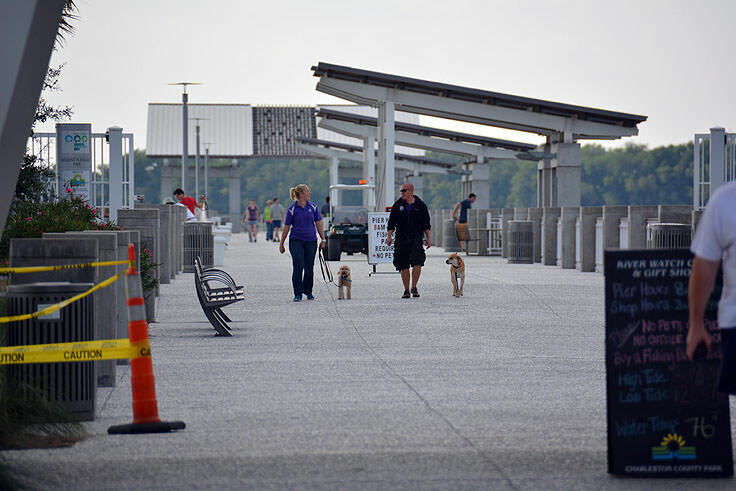 Pleasant Memorial Waterfront Park is rapidly becoming the go-to locale for incredible events, great fishing, and some of the best waterfront views in South Carolina. With a number of free or cheap ways to have fun, it's no wonder that the park is one of the top ranked local attractions by residents in the know. It's easy for visitors to get in on the fun as well, whether it's a quick stop during a long coastal road trip, or a full day of fishing, munching, playing, or relaxing and enjoying the panoramic views. Regardless of a visitor's preferred means of having outdoor fun, they're sure to find it against the stunning backdrop of the Arthur Ravenel Bridge at the Mt. Pleasant Memorial Waterfront Park.